Gaze out of the window at Three Choirs Vineyard in Gloucestershire and you could easily be in Southern France, Western Australia or California. 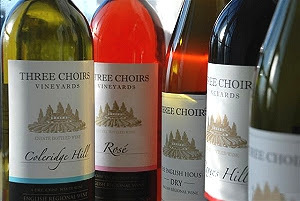 Three Choirs is the most awarded single estate wine producer in the UK. Originally the dream of wine lover Alan McKechnie, in 1972 he decided to transform his fruit farm into the thriving vineyard it is today. Now managed by Thomas Shaw, the vineyard has grown alongside England’s reputation for wine. 2 More Masterchefs Join The Seasoned Team! 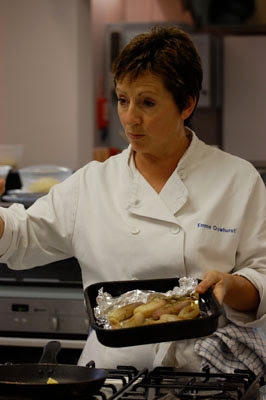 Seasoned Cookery School are pleased to announce that two more Masterchefs will be joining their team of expert chefs. 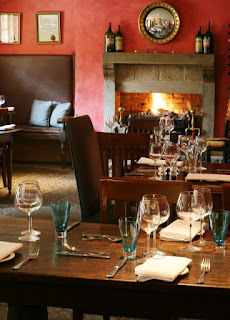 Claire Hutchings, 2011 Professional Masterchef finalist and 2012 Masterchef finalist, Andrew Kojima will be joining Seasoned Cookery school to offer day courses and unique Demo & Dine evenings in the beautiful surroundings of the Catton Hall Estate. "I like to showcase my skills by taking one ingredient and doing several things with it and the presentation is important - I want to impress my diners and make it a moment to remember." The Great Taste 2013 Supreme Champion award will be sponsored by Harrods in a new agreement with The Guild of Fine Food, organiser of the Great Taste Awards which is now entering its 19th year. Last year the awards scheme attracted over 8,000 entries and this September, Harrods will present the Supreme Champion trophy to the producer of the most exceptional food or drink entered into Great Taste 2013 that was judged "faultless, exquisite, outstanding" by the panel of experts. The Ambrette Restaurants Margate and Rye have been named “Best in the South East” by the Cobra Good Curry Guide – despite not serving curry. 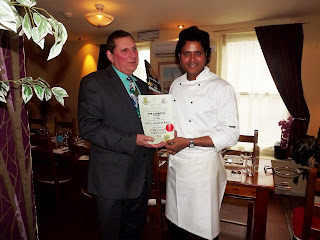 “Of the UK’s 9,000 Indian restaurants in the UK, The Ambrette is one of the elite few - it is a fantastic achievement,” said Pat Chapman, Editor of the Cobra Good Curry Guide, who visited the Kent restaurant to present chef-patron Dev Biswal with the covet award. Biswal hopes that his latest accolade will encourage the next generation of Indian chefs and restaurateurs to move away from a “de facto franchise model” where almost every high street curry house offers a near identical menu. 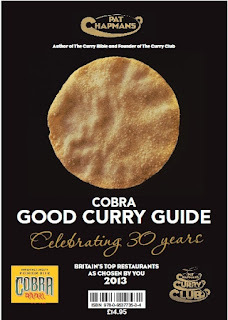 Despite being listed in all the major restaurant guides and having won numerous awards, Biswal feels that the Cobra Good Curry Guide tribute is the pinnacle. The Cake & Bake Show - the UK's biggest experiential event dedicated to all things baking - is proud to announce that Paul Hollywood, Dan Lepard, Simon Rimmer and Andrew Nutter will be at the show in Manchester. They will join Mary Berry, Eric Lanlard, Peter Sidwell, Mich Turner and all of the contestants from Great British Bake Off 2012. Expanding to three days, the Cake & Bake Show Manchester brings together all of the nation's favourite baking stars on April 5-7. Paul Hollywood, the UK's most famous bread maker and judge on the Great British Bake Off returns to the show, demonstrating on the main Bakery Stage and hosting live bake offs on Grainchain.com's stand on the Sunday. Le Metro, Knightsbridge's local wine bar and bistro, will be featuring pancakes with a kick in celebration of Shrove Tuesday on 12th February. Available all day, guests can enjoy classic combinations of lemon and sugar with an additional shot of Tequila, or warm chocolate and clotted cream with a shot of baileys for just £7.50 (£4.50 without). Open from 7am daily, Le Metro offers a menu of small and large plates making it a firm favourite with locals looking for a bite to eat, or a glass of wine after work. Located perfectly between Harrods and Harvey Nichols, Le Metro is also ideal for those enjoying the shopping delights of Knightsbridge. The White Swan Inn, Pickering, has revealed that it is offering guests a magnificent last minute 2 for 1 offer staying in either one of their country-chic Vintage Nest rooms or one of their lavish Courtyard rooms between the 28th of January and the 13th of February. The White Swan lnn is renowned for its' hospitality, unusual real ales and delicious, award winning Yorkshire food with meat sourced from the famous and very exclusive London butchery, The Ginger Pig. Whether you fancy a couple of days rest and relaxation away from the stresses of everyday life or an early Valentine's Day romantic weekend away, this unbelievable offer really is too good to be missed. 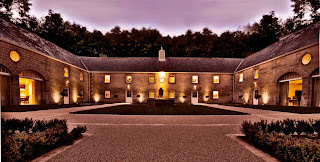 Close House Hotel, Northumberland's 18th century mansion, has revealed a Valentine's getaway offering 'loved up' couples the ultimate in luxury dining and relaxation. Set in the heart of the countryside with roaring fires and plush furnishings aplenty, Close House makes a truly romantic setting to escape with your loved one and unwind in style this February. Available 14th until 16th February 2013, couples can enjoy an overnight stay in the main mansion house, a chilled bottle of champagne upon arrival and a three course evening meal in the opulent Argent D'Or restaurant from £135 per person. Executive chef Simon Walsh focuses on contemporary cuisine with a traditional French twist, meticulously prepared using the finest, locally sourced ingredients. Special Valentine's dishes include 'Confit Duck Roulade, Chocolate & Blood Orange' and 'Roast Loin of Venison with Celeriac Puree & Red Wine Braised Salsify'. Heartwarmer Foods is introducing innovative premium-range gourmet smoothies to the healthy non-alcoholic beverage and food-to-go sectors. The company is a start-up by Pranav Bihari, a student at the University of Kent, and his partner Kaly Bihari. Heartwarmer smoothies are a blend of fruits, gluten-free oats and spices and contain no added sugar or artificial ingredients. The smoothie range is available in three flavours: 'blackcurrant, oat and spice', 'raspberry, oat and spice', and 'chai spice, oat and ginger'. Packaged in infinitely recyclable glass bottles with a shelf life of six months, more than 97% of the smoothies' ingredients are sourced from British farms. From Tablet To Table: Technology Creates A Feast For Our Eyes! Wine & Dine is the iPad app which enables restaurants to further enhance the dining experience by replacing their paper menus with sophisticated iPad ones. Creating a mouth-watering menu has always been a challenge for chefs and restaurant managers. You can 'say it' with words and even perhaps a few photos created in studio conditions and bearing little resemblance to the dish that arrives at the table. Now though it's technology and contemporary communication techniques to the rescue. From the evidence in the US and Asia, where tablet menus are now being used, it is very clear that all parties are benefitting, according to Nigel Hazell, chairman of Dun and Huang, the company that's launched its Wine & Dine: iMenu solution in the UK. Gordon Rhodes loved exploring the globe in search of exotic tastes and flavours and has supplied the food industry with a quality range of aromatic and flavoursome recipes for over 30 years. 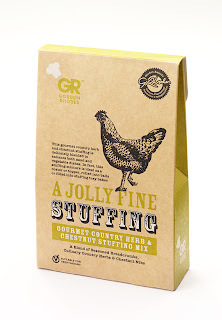 Gordon's Jolly Fine Stuffing's are not just for Sunday lunch! Creating an array of versatile meal ideas for meat, fish and vegetarian dishes our Jolly Fine Stuffing's can be used for stuffing vegetables, meat or even topping pies. Gourmet Sauce Mixes designed especially for slow cookers as well as pan fry and oven bake methods! Gordon's Slow Comfortable Stew, No Hurry Chicken Curry and Chilled out Chilli Con Carne Gourmet Sauce Mixes are all suitable for vegetarian recipe variations, offering versatile recipe options. The award winning Summer Isles Hotel is delighted to announce the appointment of Alan White as Head Chef with immediate effect. Summer Isles Hotel has long been renowned for its culinary reputation receiving a host of accolades over the years, including a coveted Michelin star for 13 years when Chris Firth-Bernard was Head Chef. Chris who retired from the hotel’s kitchen last year after 26 years of loyal service. Alan now hopes to build upon these solid foundations while adding his own style to the dining experience and so it is with great excitement that the team at the hotel are gearing up for the forthcoming season. Growing chillies has never been more popular. Now it really couldn't be easier. 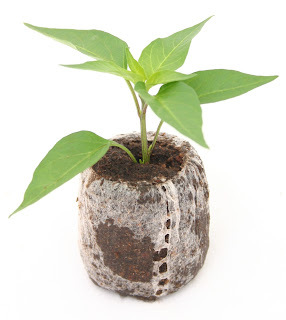 South Devon Chilli Farm has introduced a new service offering a range of seedlings which can be delivered direct to you, at your home, by post. The seedlings are available in sets of six with 24 varieties in total to choose from. The sets available are 'Hot Six', 'Stunning Six', 'Tasty Six', 'Super Six', 'Extreme Six', 'Sweet Six' and 'Same Six' (see end of release for further details). The sets of six are all available for a very reasonable £12 except for the 'Extreme Six' which consists of the mighty Bhut Jolokia seedlings and costs £18. For full details on the seedlings available visit South Devon Chilli Farm's website: www.sdcf.co.uk. Divine is sharing the love this Valentine's Day with its delicious little chocolate hearts in three flavours, gorgeous recipes, and a range of gifts available online which would melt any Valentine's heart. The chocolate hearts come in Divine's rich intense 70% dark chocolate, smooth milk chocolate, or the sublime combination of creamy white chocolate with strawberries. The 100g gift boxes, decorated in gold, are £4.50 each RRP, available from Waitrose, Liberty's and our online shop. 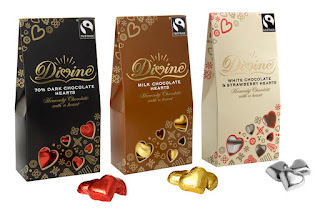 You can choose your Valentine's favourite chocolates from an exclusive range of Divine gift selections at the Divine online shop with prices starting from £20. For these and all Divine products, visit www.divinechocolate.com/shop. This Red Nose Day, ovens will be fired up and whisks will be at the ready, as the great British public goes into baking battle to help raise money for Comic Relief. To inspire the nation to host their own bake sales and raise money for those living incredibly tough lives in the UK and across Africa, 16 celebrities will demonstrate their baking prowess in The Great Comic Relief Bake Off on BBC Two. Prepare for a big dollop of laughter to be thrown into the Bake Off mix. To help the great British public raise a tasty sum, Red Nose Day has the perfect ingredients to make life in the kitchen that little bit sweeter. Dumfries & Galloway's food group, Savour the Flavours, is representing Scotland on the EU stand at International Green Week in Berlin from tomorrow. Green Week is the world's biggest fair for food, agriculture and horticulture and runs from the 25th - 27th January. Savour the Flavours is presenting on the EU stand as an example of best practise in rural development. 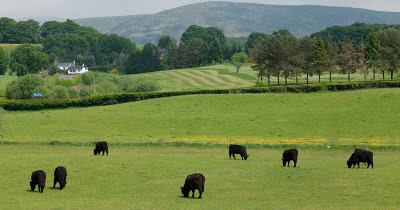 The organisation will give a short presentation, screen videos of artisan producers, promote the annual food festival Flavour Fortnight and will sample Dumfries & Galloway food and drink, including award winning local whisky and champion haggis to reflect the Burns Night timing of the event. Savour the Flavours is funded by an EU grant via LEADER and by Dumfries & Galloway Council, with in-kind support from Dumfries & Galloway's food and drink industry, and the organisation is now recognised as one of Scotland's most effective food and drink networks. 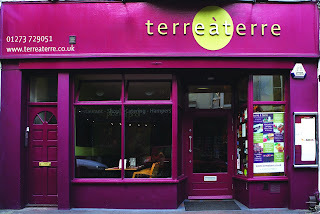 After a hugely active couple of months stripping the kitchen back to nothing and rebuilding it again the team are excited to be getting back to cooking and preparing to receive customers, the new state of the art shiny kitchen which services the 100 cover restaurant has had a new lease of life, an inspiring start to Terre à Terre's 20th year in business. 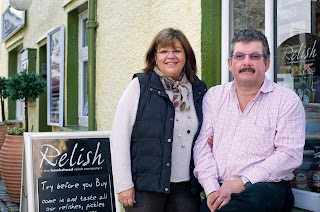 As part of National Heart Month in February, Somerset farmer Andy Fussell is recommending those looking to lower their cholesterol levels through healthy eating try taking one simple step and swap their olive oil for the golden goodness of rapeseed oil. With half the saturated fat of olive oil and bursting with essential fatty acids, rapeseed oil is known to reduce cholesterol, maintain heart health, joint mobility and brain function. It is also a rich, natural source of the powerful antioxidant Vitamin E and Omegas 3, 6 and 9, and unlike olive oil even retains its health benefits at high temperatures (240oC smoke point), so it's especially good for cooking, marinating, baking, frying and roasting. 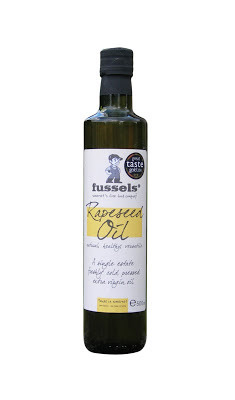 So be extra kind to your heart in 2013 and look out for Fussel's Fine Foods delicious new season freshly cold-pressed rapeseed oil on Asda supermarket shelves. 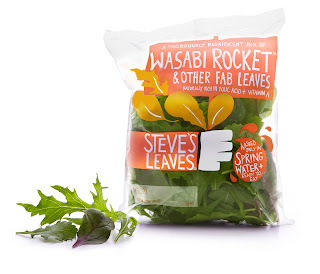 The team at Steve's Leaves in Hampshire has been inundated with comments from men across the country commenting about how good bags of Steve's Leaves Wasabi Rocket and little leaves are. Known as the 'man leaf' at Steve's Leaves HQ, fiery Wasabi Rocket has taken some men by surprise and instead of turning their nose up at a bowlful of the green stuff, they've enjoyed it so much that they've felt compelled to write and let Steve and the team know. Available from Ocado and Wholefoods, this hot little leaf has been mixed with other fab baby leaves like red spinach and mizuna. Steve, the Steve from Steve's Leaves comments: "Wasabi rocket is a fantastically fiery fellow. It's not for the faint-hearted so that might be why it is proving popular with lots of men. The mix is naturally rich in vitamin A and folic acid and tasty enough to eat on its own or next to a grilled sirloin steak with a drop of balsamic. Delicious!" Curry-crazy Brits will blow more than £30,000 on Indian grub in their lives, the Curry Club can reveal. The average Brit will splash out £20 a month cooking Indian food at home, according to new research. They will also fork out £31.44 eating the spicy dishes in restaurants over the same period, according to The 2013 Cobra Good Curry Guide. This means that over a 50-year period we will each spend £30,864 on curries. And, despite the recession, the guide claims curry houses are thriving as the UK refuses to give up its favourite food. The UK's 9,000 curry restaurants attract 2.5 million customers a week, according to Curry Club statistics. And the curry sector is worth about £777 million each year, despite a fall of 20 per cent since the economic downturn began. Pat Chapman, author of the Guide is confident the industry will ride out the current recession. Millie’s appreciates all the hard work mothers put in every year, and their Mother’s Day Iced Giant Cookies and Cookie Cupcakes are the perfect way to say thank you. 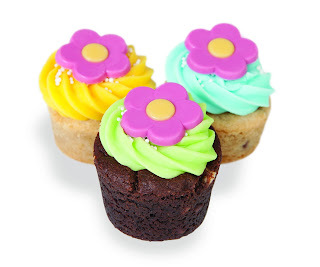 Heading up the new range is a floral twist on the classic Cookie Cupcake, with round cookie cupcakes coming topped with a delicate chocolate daisy design. They can be ordered as singles (starting at £1.25) or as a dozen in a heart-shaped box for £17.99. The Cookie Cupcakes are totally unique to Millie’s and based on their famous cookie dough. The cupcakes have a deliciously gooey centre, contain generous chunks of chocolate chips and are available in milk, white and double chocolate flavours. Designed by the same in-house team that creates Squires Kitchen’s popular cupcake cases, these new food-safe Decorative Food Wraps will bring instant style to cakes and bakes. Perfect for weddings, parties, picnics and gifts, the wraps are all you need to present your edible homemade treats. Decorative Food Wraps are printed in a range of pretty polka-dot colours. Use them to wrap iced biscuits, cake slices or handmade truffles for beautiful gifts and even savoury foods such as chips, pastries and sandwiches for a great way to brighten up lunchboxes. You can also use them for baking: they make a contemporary alternative to cupcake cases and loaf tin liners, whether you’re baking cupcakes, muffins or cakes. They make cute jam jar covers and colourful linings for gift bags and cupcake boxes, too. 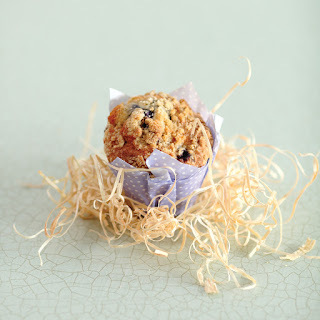 The multi award-winning Suffolk Food Hall, the one-stop-food-and-drinks emporium showcasing the 'best of the best' of the county's produce, has just launched its 2013 cookery school and 'masterclass' calendar. The 20-plus cookery classes led by chefs such as Emma Crowhurst (Leith's School of Food and Wine; Ready Steady Cook; BBC's Food and Drink) as well as locally-renowned bakers and butchers are designed to appeal to everyone, from absolute beginners wanting to learn new cookery skills to semi-professionals wanting to hone their foodie talents. This year, the cookery classes have a new home: 'The Cookhouse' (adjacent to the Food Hall). Boasting a first-floor restaurant serving traditional food with a contemporary twist, and with unrivalled views of the iconic Orwell Bridge and the surrounding Area of Outstanding National Beauty, the Cookhouse's ground floor has a bespoke, fully fitted demonstration kitchen where these classes are now held. Do You Make An Award Winning Pie? New Year’s Resolutions Never Tasted So Good!